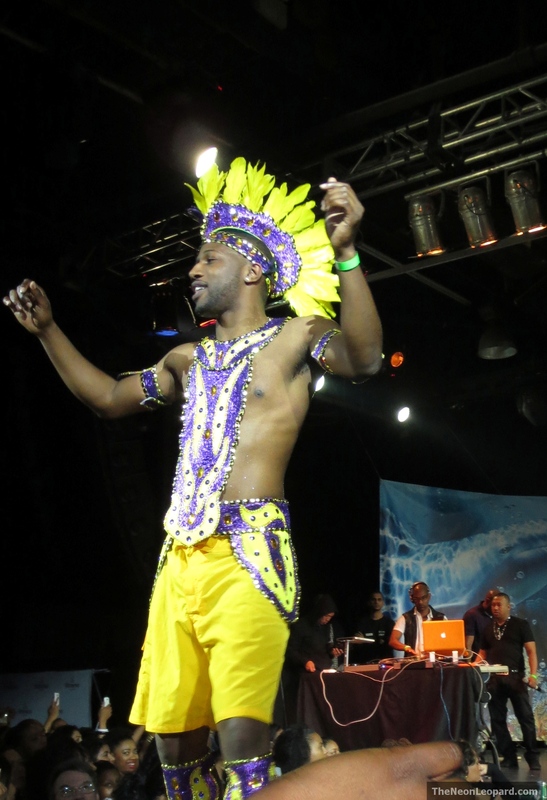 It’s that time of year when all the different bands that partake in Caribana (now known as Toronto Caribbean Carnival or something to that effect) reveal their themes and costumes to the masses. It goes without saying that many have been anxiously awaiting the 8-year old band Carnival Nationz (CNz) launch that happened on Saturday night at Koolhaus. A few of my friends and I have been volunteering with Carnival Nationz since they debuted years ago and with every year the thrill never dies. Helping backstage with any last-minute touches and getting the models ready for the stage marks the beginning of the Caribana season! This year their theme is THE REEF, and with that it was expected that the colours would be plentiful and very vibrant. The 5-time Band of the Year winner has never been one to disappoint so as the air filled with anticipation, all frustrations were forgotten as soon as the mc got on the mic to start the presentation. There was a giant backdrop that displayed the theme logo and gave the feeling of being under water. There are 12 sections in total and thanks a million to my friend Joseph who was taking in the show from the crowd while we were backstage. CNz always sees a theme through and this year was no different. It was the hope since the theme was The Reef that they would play with different colours to encapsulate the beauty. Not only were the colours vibrant , each section selected colour combinations that worked really well. The headpieces fit the name of each section and gave the visual they were going for when showcasing the costumes. Registration started yesterday so if you’d like to jump on the road with Carnival Nationz, get on it otherwise you’ll miss out! To stay updated on anything to do with CNz, follow them on Twitter, Facebook and check out their pics on Instagram (cnzinc). Their mas camp will be located at 116 Howden Rd., Units #4 & 5 in Scarborough. To contact them, email: info@carnival-nationz.com. See you on Lakeshore Blvd for Caribana on Saturday August 3rd! Real Techniques Brushes- Now in Canada! Wow, pretty colours! I have a coral reef tank at home and the band has done a nice job emulating the vibrance and variety of tones. I bet it will look amazing once everyone is together! Lovely pics! I can’t WAIT to see all the sections together, Seph!